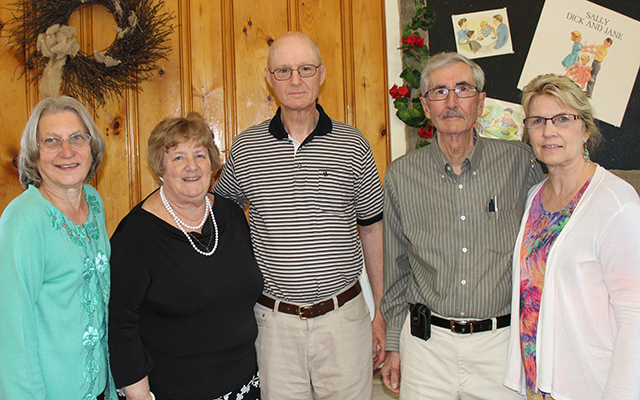 Meeting recently at the Southern Aroostook Agricultural Museum, former Ricker College students from left, Robin Barker, Barbara and Bob Souther, faculty members John Elliott and Karen Donato discussed the upcoming reunion planned for students attending Ricker Classical Institute and Ricker College. The event is planned for Sept. 7-9 at the Shiretown Inn and Suites. The celebration will earmark 170 years since the beginning of the school’s history. The last graduating college class was in 1978. Registration is $70 per person for all activities. The deadline for registration in July 25. Forms are available at the County Co-op, Houlton Pioneer Times office or by email: rickerreunion@yahoo.com. There will be a social on Friday evening, a coffee Saturday morning, visits to the Ricker Room, a tour of the former campus and downtown Houlton, a visit to the Southern Aroostook Agricultural Museum, a banquet in the evening and a brunch on Sunday. All former students, faculty and support staff are welcome to join in the event. Call 207-694-6099 for more information.